← Swim at the Beach… in Downtown Tampa! Everybody loves the GMC Acadia, whether it’s for its style, size, or power. But now there’s even more to love about it! The restyled GMC Acadia is new for 2017 and has lots to offer. Check it out! The restyling starts with a trim-down, losing 700 pounds with the new model year. With this weight comes a decrease in size, but not without its benefits! The Acadia now fits neatly into the midsize crossover segment and has new rivals like the Honda Pilot and Nissan Pathfinder. Despite its decrease in size, you’ll still have plenty of room on the interior. You can fit up to five passengers, and six or seven with the optional third row. Another update the Acadia receives is a standard 2.5-liter four-cylinder Ecotec engine. You’ll still get plenty of oomph, with 194 horsepower and 190 ft-lb of torque. Don’t think you won’t get efficiency, though. You can get up to 26 mpg on the highway, an impressive number for a midsize SUV. So if you want space, efficiency, and power, you’ll have the perfect combination of all three with the newly restyled GMC Acadia. Check it out at Rivard Buick GMC! 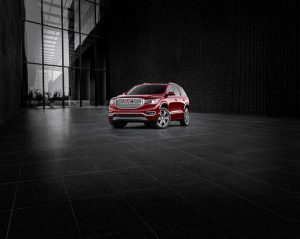 This entry was posted in GMC Acadia and tagged 2017 Acadia, 2017 GMC, 2017 GMC Acadia, New GMC Acadia, Rivard Buick GMC, Tampa, Tampa Acadia. Bookmark the permalink.